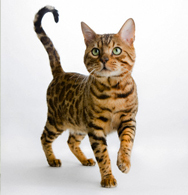 The Bengal, is a large wild looking spotted coat with short glossy fur. While still rare worldwide, their popularity is growing rapidly. 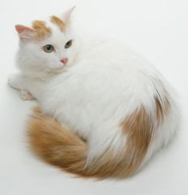 Bengal is domestic in temperament but has retained its exotic, feral look. 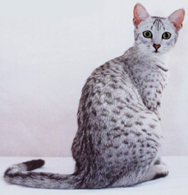 The Bengal is the most numerous and popular of the spotted domestic breeds. 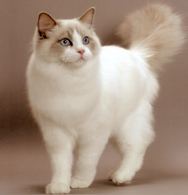 Colours : Brown tabby, seal lynx point, seal sepia tabby, seal mink tabby blue, silver, peach and red. Temperament : Bengals that are at least fourth generation are usually friendly and confident with their family members.Very athletic, Like being in water. 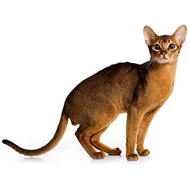 The Bengal is an athletic frame. 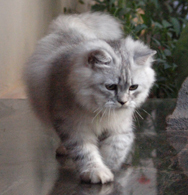 The body is long and very muscular, resembling the leopard cat. The head is a broad modified wedge-shape and is longer than it is wide. 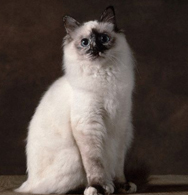 Large almond-shaped eyes, set wide apart, and short rounded ears enhance the feral look. The spots can be black, brown, tan, chocolate or cinnamon and contrast with the background color. 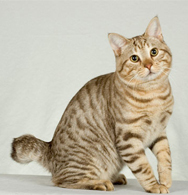 Vivid markings with sharp contrast of colors is the mark of a show Bengal. The coat is short with a thick, luxurious, unusually soft texture. Large feet with black paw pads.